When I was little I obsessed over everything strawberry. I loved strawberry ice cream, strawberry shortcake, and strawberries straight from the garden. I even remember proudly bragging to my little fellow classmates that my Nana was a genius because she made strawberry pie. My young, sugar-loving taste buds loved that she didn’t corrupt the sweet taste of strawberries with the tangy rhubarb…100% sweet strawberry goodness! My mom helped me plant strawberries in our garden. I was so excited to be growing my own strawberries. I even remember her going out at the crack of dawn to rescue some of our small crop before the birds ate them all. It was a labor of love and they tasted fantastic! 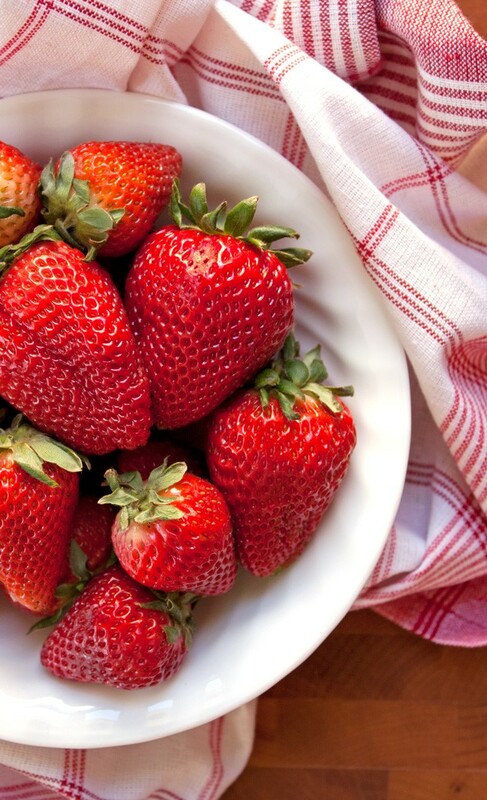 June always reminds me of the delicious taste of fresh picked strawberries. Most of the orchards in New York (where I grew up) and Connecticut (where I live now) have pick-your-own berries all summer, starting with strawberries in early June. I love tramping around the orchards, picking and tasting the strawberries! 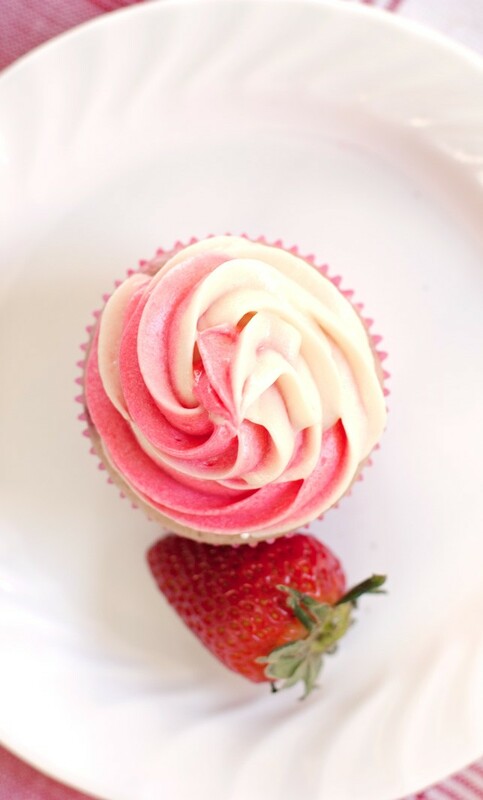 Today I’m sharing a summery strawberry recipe, Strawberry Cheesecake Cupcakes! The cake is flavored with real strawberries, and doesn’t include a) a boxed strawberry cake mix or b) a packet of strawberry jello. 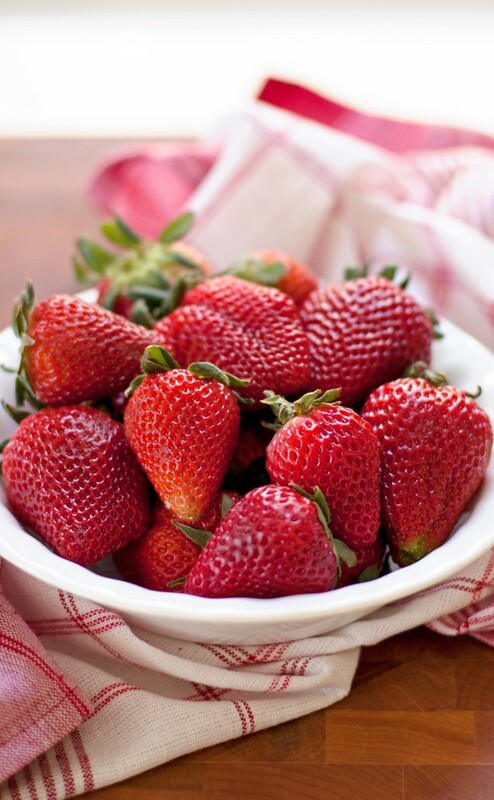 I prefer the natural taste of strawberries over the artificial flavoring. 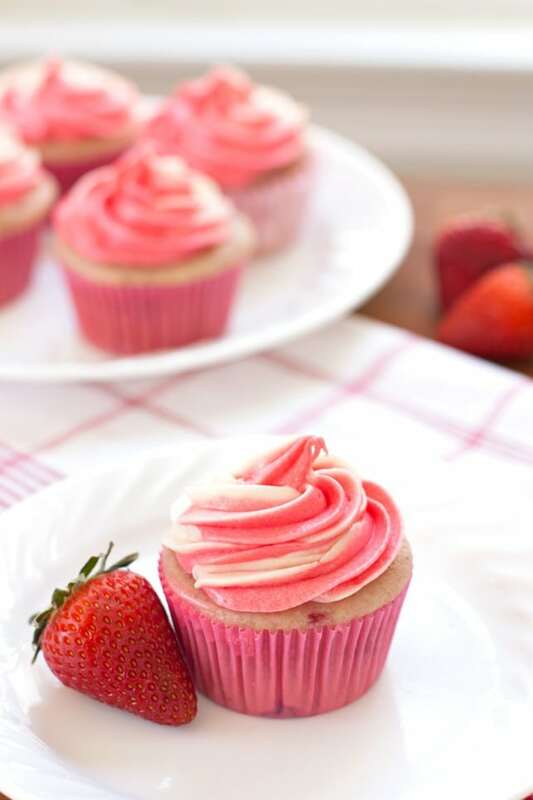 If you like the bright pink color typical of strawberry cakes, just add a few drops of red food coloring to the batter. 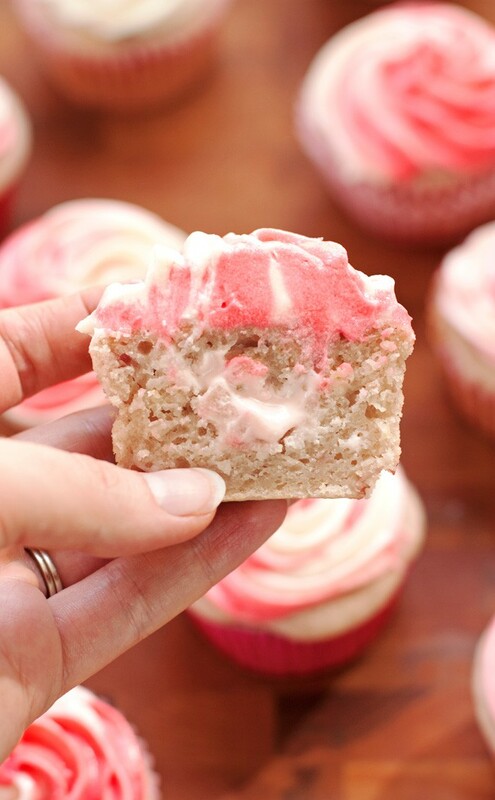 The tangy cream cheese frosting is a perfect complement to the sweet strawberry cupcakes. I think even my younger taste buds would have appreciated it, but you can always substitute a vanilla butter cream frosting if you prefer. Just use all butter in the frosting recipe instead of the butter-cream cheese mixture. b) beat the butter and the powdered sugar first then just add a little cream cheese for flavor. I divided my frosting in half, dying one half pink and keeping the other half white to create a pretty pink and white swirl! As an added bonus I decided to experiment with a yummy cupcake filling. I found there was no need for fancy filling equipment. I gently cut a hole in the center of each cupcake, filled it with a little strawberry cheesecake filling, and then placed the cupcake lid back on top! Voila! Instant strawberry cheesecake surprise! Yummy! 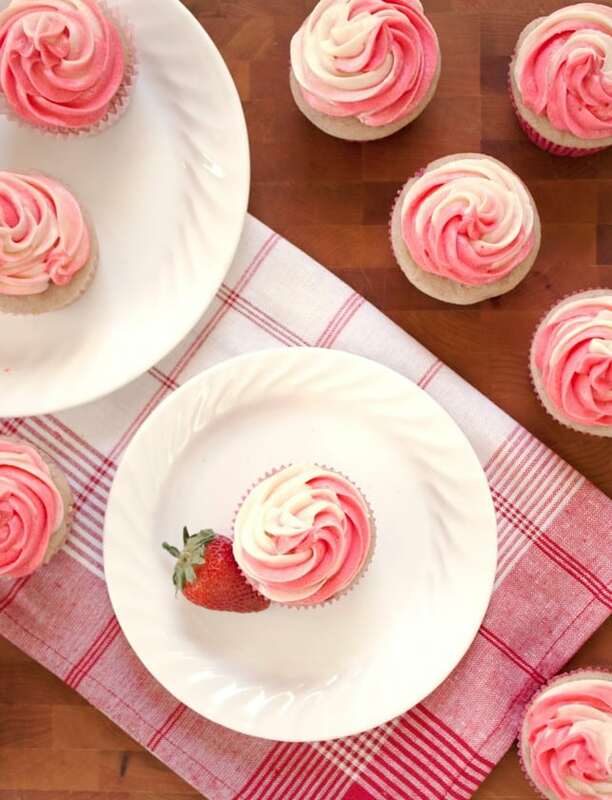 I hope you enjoy these sweet, tangy strawberry cupcakes. My adult taste buds even found an orchard that kept pace…These cupcakes pair perfectly with this sparkling summer delight! 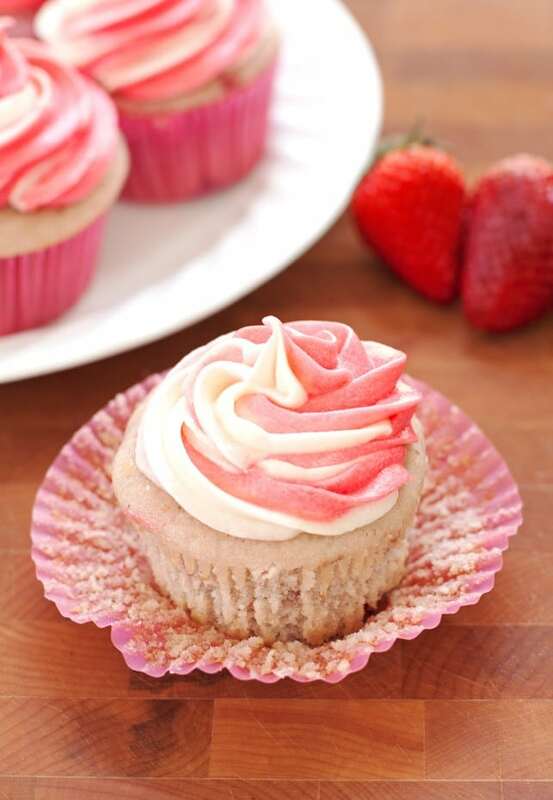 Fresh strawberry cupcakes topped with tangy cream cheese frosting and filled with a strawberry cheesecake surprise! No cake mix or jello needed! Pulse about 4 strawberries in a food processor to get about 1/3 cup chunky puree and set aside. Puree about 8 strawberries in a food processor to get about ½ cup + 2 tablespoons of liquid puree and set aside. In a medium bowl combine flour, baking powder, baking soda, and salt. Slowly add dry ingredients to wet and gently stir until there are no lumps in the batter. Gently fold in strawberry chunks and lemon zest. 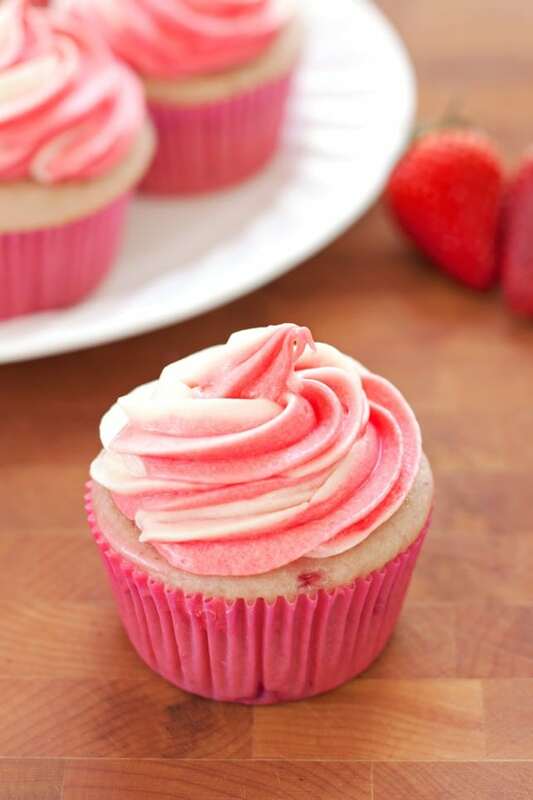 Make filling by combining 2 tablespoons of frosting with the 2 tablespoons of liquid strawberry puree set aside during cupcake making. Cut ½” diameter holes in cupcakes, making sure not to go through the bottom (I went about half way down the cupcake). 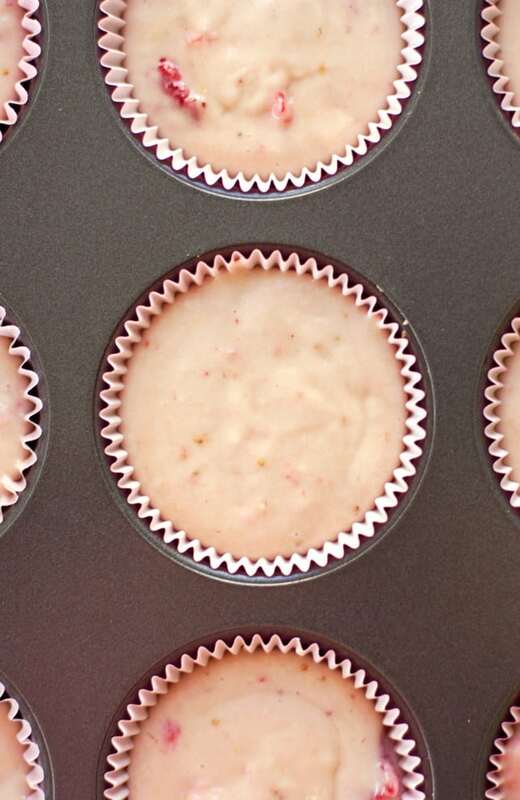 Fill cupcake with 1 teaspoon each of the filling then cover with the piece of cupcake originally removed. Divide remaining frosting in half, dying one half pink with red food coloring. Put frosting in a frosting bag with pink on one side and white on the other. ** Pipe on cupcakes, serve and enjoy! *Too much cream cheese will cause frosting to be runny. Will be using this recipe for a coworkers birthday. I’m very excited. I made these for Valentine’s Day on yesterday and I was amazed at how simple the recipe was. I decided to try this recipe after SEVERAL failed attempts to make cupcakes that called for jello and/or sour cream. The cupcakes I made using the other recipe left me with sunken, dense, half-baked blobs of batter. I didn’t get a chance to taste the cupcakes I made using this recipe because I had baked them to fill holiday cupcake orders, but the was happy with the taste of the batter and the density of the end product. If I get any feedback from my customers, I’ll update this post. Wow! What an alluring little cupcakes. Would love to have them anytime! So I made these yesterday and OMG! I did change a few ingredients because I wanted it less dense and super moist. I changed the butter to oil, added an extra egg and used sour cream instead of yogurt because that’s what I had. The result was amazing. Moist, slightly dense and just heaven. Thanks so much! Update: tried making it with peaches because a friend wanted peach. Unfortunately-the flavor didn’t come through. I used fresh peaches but peaches naturally have a very subtle flavor to begin with. Trying blueberries tonight. Amazing recipe. I made these for my son’s cupcake sale. Though the frosting didn’t look like yours, the taste was so yummy.. Thanks for the recipe, definitely a keeper. I was wondering what you thought of making a thin graham cracker crust layer that you prebake before adding the cupcake batter? Perhaps the addition of the graham crackers would result in an even more “cheesecakey” flavor? Also would it be possible for you to post the recipe in weight equivalents? Either oz or grams would be great – I pretty much use my digital scale exclusively to measure dry ingredients when baking. Also what tip did you use to pipe? Hi Rachel! Thanks for your interest in the Strawberry Cheesecake Cupcakes and for reaching out with your questions. I haven’t tried putting a graham cracker layer under the cupcake, but it sounds like a really fun idea! You could probably bake it similarly to this gingersnap or shortbread crust, then proceed with the cupcake on top after the crust has been pre-baked. Let me know if you give it a try — I’d love to hear how it goes. Lastly, I used a 1M piping tip for these cupcakes. Thanks so much for the recipe! This was the first time that I made a cupcake recipe from scratch and I must have done something wrong. The cupcakes are very dense (kind of like a muffin) and when I pulled them out, they seemed to dent in the middle. I followed the directions to the T, but maybe I need to add more baking powder/soda? Any suggestions would be wonderful so I can make this recipe without completely failing. Hey, my icing came out well though :). Hi Breanna! Thank you for your interest in the Strawberry Cheesecake Cupcakes and for reaching out with you questions. I’m sorry they didn’t turn out how you were hoping. These cupcakes are little on the dense side, but if they are so dense they are like muffins it may have been caused by overmixing the ingredients or adding too much flour to the recipe. Do you by chance have a food scale? I recently found that my dry measures were resulting in me using 33% more flour than if I weighed the ingredients. As for the dents in the cupcakes, do you know if they rose then fell or if they never rose? If it’s the former it may help to cut down on the baking powder a little, sometimes too much leavening can make bubbles form in the cake that are too large to support themselves making the cake rise too much and fall. If the cupcakes never rose, it may be possible that your baking powder has expired. In either case, make sure your oven isn’t running hot or that you don’t open the oven door too much during baking, issues with temperature can cause the cupcakes to have trouble rising or staying risen. Ok, I had to try these for a picky friend. He doesn’t like cake a whole lot and only eats desserts covered in fruit! I put little strawberry slices on top and viola…up to his standards! They were so so good! Thanks for the recipe, really really loved the taste and texture of all of it! THANK YOU! These sound delicious! Would this work for an actual cake? Instead of cupcakes? These turned out great! Great flavor! I’ve been searching for a recipe for this weekend for days and this might be it! I still need some convincing since there aren’t many comments or reviews. Are these amazingly fantastic? Haha, thanks. These were great! I was in a bind and didn’t have Greek yogurt so I substituted heavy cream and it worked out.